Suffering From Allergies? Air Cleaning Can Help | Clean Air Act Inc. Mechanical filters are like a protective wall standing between allergens and your air circulation. There are many different kinds of air filters. 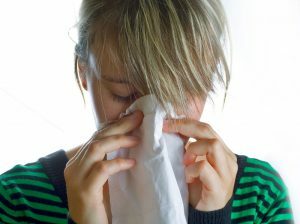 The kind that sits in your HVAC unit right now is only meant to protect the system from dust and dirt and won’t be sufficient in helping prevent the spread of allergens. For use in helping against allergy symptoms, you’ll need a HEPA (High Efficiency Particulate Air) filter. HEPA filters don’t just stop allergens from slipping through—they actively attract them to their surface, where they’ll become stuck and removed entirely from your air circulation. They’re rated to remove up to 99.9% of contaminants from your air. One drawback is that they do make it more difficult for air to travel through, but our trusty HVAC services in Beaverton, OR will help you to avoid this problem. Filters, as their name implies, only trap contaminants and prevents them from entering your air circulation. Air cleaners, on the other hand, are a bit more proactive in their approach. Electronic air cleaners create a field of electricity, ionizing the particles that pass through it. Once ionized, they get stuck to a pair of plates on the cleaner. The electrically charged particles will then continue to attract smaller particles. For particles that are too small for mechanical filters to catch, electronic air cleaners are a great solution. They do require an external power source, but an HVAC technician will help you figure out the details and how to integrate it into your current HVAC system. Mechanical filters and electronic air cleaners do have one thing in common: they can’t prevent the spread of living contaminants. Bacteria, viruses, and other pathogens can still populate freely. This is where a UV germicidal light comes in. The UV light destroys the microorganism’s ability to multiply and spread disease. They’re great options because they don’t require the use of disinfectants, which can fill your home with harmful chemicals and bad smells. This device is installed in the return air duct and eliminates the germs that pass through it. Maintenance is effortless since all you need to do is replace the bulb after it burns out. If you’re getting stuffy, don’t worry. We can help keep the allergies away. Contact the Clean Air Act Inc. today!